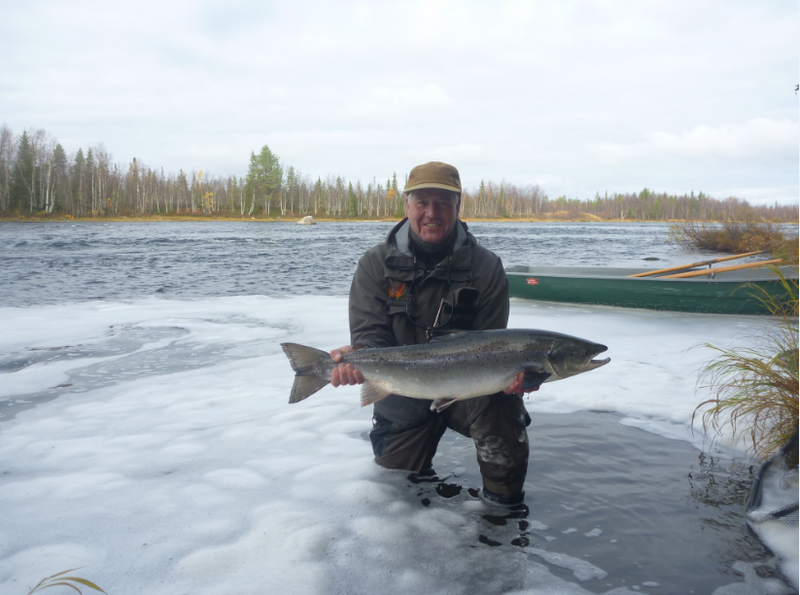 We have fished The Kola Peninsular in Russia annually for almost 20 years, starting on Southern rivers like the Varzuga and Pana, catching lots of small salmon. This is a great learning curve, fortunately there are many fish, so losing a few doesn’t matter because you know, unlike fishing in the UK and most other Atlantic salmon fishing destinations that another one will soon follow. We gained great experience catching these fish. 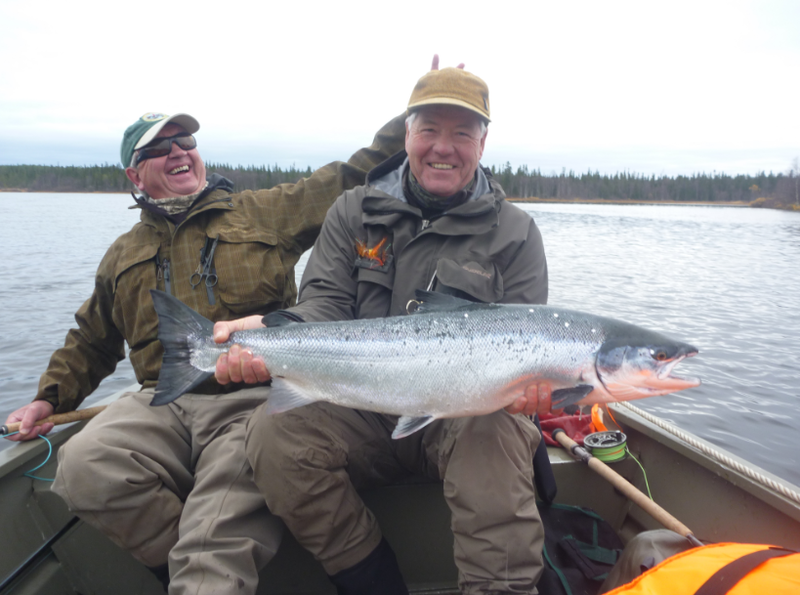 After a few years serving our apprenticeships we met Lawrie Hickman at Murmansk Airport he was then camp manager at Yokanga and he persuaded us to visit this mighty river, which we fished for 7 years, with great success. When Lawrie left to join Guideline we then frequented the majestic Kharlovka and Litsa and we still enjoy these magnificent rivers. Lawrie last year was invited to fish UMBA river, and we were again influenced by him to fish the river on the first week of October this year. With the rivers on the north coast closed this sounded like a good idea. The river UMBA has a good run of Osenkas, these are fresh sealiced silver salmon that enter the river from late August onwards until the river freezes. They then stop in the river under the ice and spawn the following Autumn. 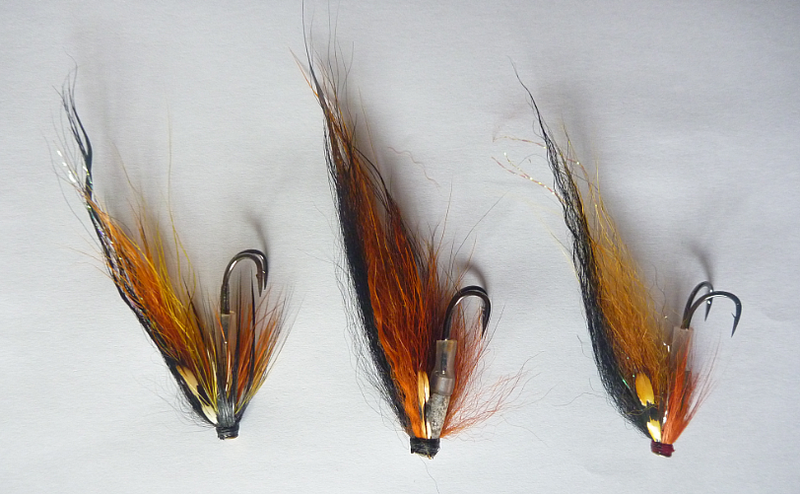 The first week in October sounded great as it would hopefully bring the salmon season to a good conclusion. The journey started early on Friday morning and ended over 24 hours later at Umba camp. We were greeted by the manager and owner of Salmon Junkies, Steffan Juhl who told us that the river was unseasonably high ( at least 1 metre above normal ) but clear, and they were getting fish. Things looked good. After a few hours sleep we had brunch and started our fishing adventure. Although the river was high, it was a positive 8 degrees, so I set up a Triple density Float/Int/Sink 2 shooting head and armed it with one of my favourite small Willie Gunn templedog flies tied on a little bottle tube, I figured that with 8 degrees of water temperature the fish should move to this set up, and it proved very successful. The group of 10 fishermen were divided into 5 pairs, 3 of the pairs fished the lower river, from both boat and bank and the other 2 pairs were ferried upriver by boat, followed by walks through the forest of up to 1 hour to reach the super pools on the upper river. Every day each pair fishes different water, and change beats at lunchtime, hence we got to fish all of the beats at least once. The fishing was not like other visits to the Southern Kola rivers we had fished before, it was not easy, you had to work hard for your fish, but on the positive side most of the fish we got were silver and sealiced and of excellent quality, and were well earned. With most of the fish in the UK and Scandinavia now turning to their spawning colours the silver fish that we were getting were a great welcome bonus. Our week proved to be a success with over 70 fish to 10 rods.For each 20lb fish caught there is a celebration at dinner comprising of vodka for everyone and a 20lb club hat for the captor of the fish. In all there were 8 – 20lb fish and 1 – 30lb fish caught in the week, all bright fresh fish and mostly sea liced MAGIC !!!!!!! I was lucky enough to get 4 of these magnificent creatures, including fish of 25lb, 24lb and 23lb in one day. Awesome !!! !